Proteins do most of the real work in cells and are modified in accordance with functional requirements. An LMU team has now shown how proteins are chemically altered on the ribosome, even before they fold into the active conformations. The functional properties of proteins – whether they serve as catalytic enzymes or play purely structural roles – are largely dictated by their three-dimensional shapes, which are in turn dependent on their amino-acid sequences and can be altered by chemical modification. LMU structural biologist Professor Roland Beckmann studies the many essential tasks performed by proteins in cells, focusing in particular on those that take place during their synthesis. Protein synthesis is carried out by molecular machines known as ribosomes, which are themselves composed of proteins and ribosomal RNAs. These ‘organelles’ translate genetic blueprints encoded in ‘messenger RNAs’ into the specific sequences of amino acids that define the particular function of each type of protein in cells. Ribosomes work rather like assembly lines, connecting amino acids together in the sequence dictated by the mRNA to which they are bound. Beckmann and his research group at LMU’s Gene Center have now used cryo-electron microscopy to determine how certain enzymes interact with ribosomes to chemically modify nascent proteins. 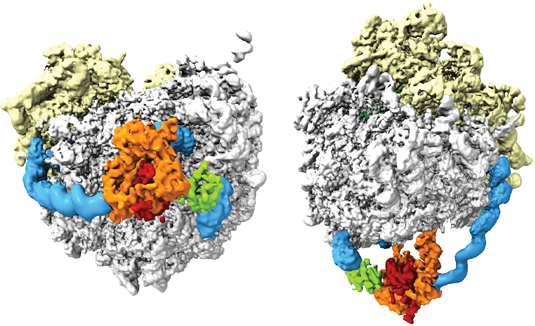 By imaging purified and flash-frozen ribosomal complexes in the electron microscope, they were able to reconstruct the modification process in three dimensions. The study appears in the journal Nature Structural and Molecular Biology. Many proteins undergo chemical modification while they are still associated with the ribosome. Protein synthesis begins at the N-terminal end and, as the chain of amino acids grows, it is directed into the exit tunnel of the ribosome. In the cells of higher organisms, the first amino acid in most proteins is modified by the attachment of an acetyl group (CH3COO−) by enzymes known as N-acetyltransferases (NATs). This reaction takes place ‘cotranslationally’ as the N-terminal amino acid emerges from the tunnel, while the rest of the protein is still being synthesized. The NAT-dependent modification is essential for the cellular functions of the proteins. “However, the nature of the interaction between these acetyltransferases and the ribosome was not known prior to our study,” says co-author Dr. Birgitta Beatrix.